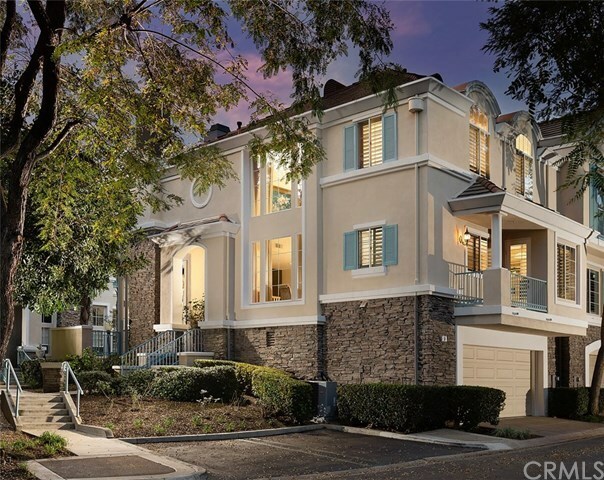 Don't miss this gorgeous townhouse in the âNewport Ridge Vistas" community in Newport Coast. Step into this home and instantly visualize yourself living your best life with huge windows making the entire home light and airy, custom fireplaces in the Grand Room and Master Bedroom, walk-in closets, and spacious and open floorpan. This home offers 2 bedrooms plus an office/loft that can easily be converted to a 3rd bedroom if needed. Fall in love with the timeless finishes throughout this former model. Stay cool year-round thanks to the Central AC. The private, gated patio has two gas hook-ups, perfect for your outdoor barbecue Summer get-togethers, conveniently located next to the beautiful community pool. The over-sized 2 car attached garage features epoxy flooring, wall-length cabinets with adjustable shelving, discrete storage space for larger items and canned ceiling lights. This gated, resort-style community offers a crystal-clear swimming pool, stunning ocean views (you can see Catalina on clear days), lush canyon landscapes, and city lights at night. You'll be just a few minutes away from the best beaches in Southern California, Fashion Island, top Restaurants, Yacht Clubs, Tennis Clubs, Hiking Trails, Private and Public Schools, Community Center with a Variety of Classes, Sports, and Clubhouse.